Containment Protocols: RPC-104 is to be held at Site-██ within an underwater steel-reinforced plexiglass containment cell measuring 2m x 3m x 2m whenever possible. Given RPC-104's physiology, it is nigh impossible to permanently contain within a cell through conventional means. For reasons unknown, it is self-contained within Site-██. If RPC-104 leaves containment at any time, it is to be brought back to its cell as soon as a retrieval team is available. Description: RPC-104 came to the Authority's attention on ██/██/1992 during an attempted Site expansion. 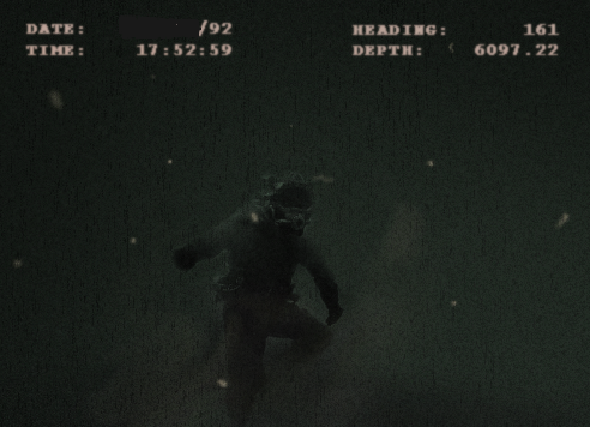 RPC-104 is an adult human male, roughly 1.85 meters in height, and appears to be wearing United States Navy surface-supplied commercial diving equipment with no visible tank or umbilical to supply it with oxygen. However, it does seem to breathe, as audio recordings picked up what can only be described as a continuous attempt in catching its breath. It wears a tool belt across its waist that appears to have an unlimited capacity. Recorded footage has shown RPC-104 to use a variety of tools, including an oxyacetylene welding torch which maintains functionality despite having no connections to an oxy-fuel setup. Any and all equipment retrieved from RPC-104's tool belt have been in severe disrepair. For instance, the welding torch is rusted and covered in barnacles. RPC-104 can only exist within the loosely-defined region of the Bermuda Triangle (Site-██). Any attempts by research teams to relocate RPC-104 off-site have resulted in its dematerialization and transportation to a random point within Site-██. RPC-104 is infatuated with rebuilding and maintaining a certain destroyed structure (RPC-104-2) on the ocean floor, 6,115 meters deep. All attempts of rebuilding the structure by RPC personnel have proven futile due to the local fauna and other phenomenon impeding their progress. Its purpose is unknown. (See Addendum RPC-104.2) RPC-104's physical body can become immaterial at will and escape containment by transuding through its containment cell. It will then make its way towards RPC-104-2, where it will begin rebuilding the structure. If transported above water-level, RPC-104 will eventually produce extremely aggressive behavior and do whatever it deems necessary to submerge itself again. Once underwater, RPC-104's behavior normalizes. When questioned in numerous interviews, RPC-104's only response is: "I have to fix it." After being granted permission to build RPC-104-2 to its completion, RPC-104 gathered materials previously unseen from across Site-██ and fully completed RPC-104-2 after only three (3) weeks. Afterwards, RPC-104 returned to its containment cell, sat in the center of the chamber, and said "I'm done." All attempts to discuss further on the topic were met with silence. RPC-104-2 resembles a large radar dish, approximately 11m tall. When supplied power, RPC-104-2 is capable of [DATA EXPUNGED]. Mobile Strike Force Xi-12, "Bottom Feeders"1, was immediately deployed and tasked with assessing the situation in order to prevent further usage of RPC-104-2's primary effect, resulting in the destruction of RPC-104-2. Termination of RPC-104-2 resulted in its attempted reconstruction by RPC-104. At this time, by order of Site Directors █████ ██████ and ███ ██████████, allowing the finalization of RPC-104-2 by RPC-104 is strictly prohibited. Supplying power to RPC-104-2 will result in the immediate termination of all involved personnel. RPC-104 must be under surveillance at all times and RPC-104-2's progress must be destroyed every week. 1. Xi-12, "Bottom Feeders", is a Mobile Strike Force team dedicated to the capture, containment, or destruction of deep-sea phenomenon.